A hallmark of T cell activation in vitro and in vivo is the clustering of T cells with each other via interaction of the LFA-1 integrin with ICAM-1. The functional significance of these homotypic aggregates in regulating T cell function remains unknown. We used an APC-free in vitro activation system to demonstrate that stimulation of purified naive CD8 T cells results in enhanced expression of ICAM-1 on T cells that is sustained by the inflammatory cytokine IL-12 and associated with robust T cell aggregates. ICAM-1–deficient CD8 T cells proliferate normally but demonstrate a striking failure to aggregate. Interestingly, loss of ICAM-1 expression results in elevated levels of IFN-γ and granzyme B, as well as enhanced cytotoxicity. Similar results were obtained when anti–LFA-1 Ab was used to block the clustering of wild-type T cells. 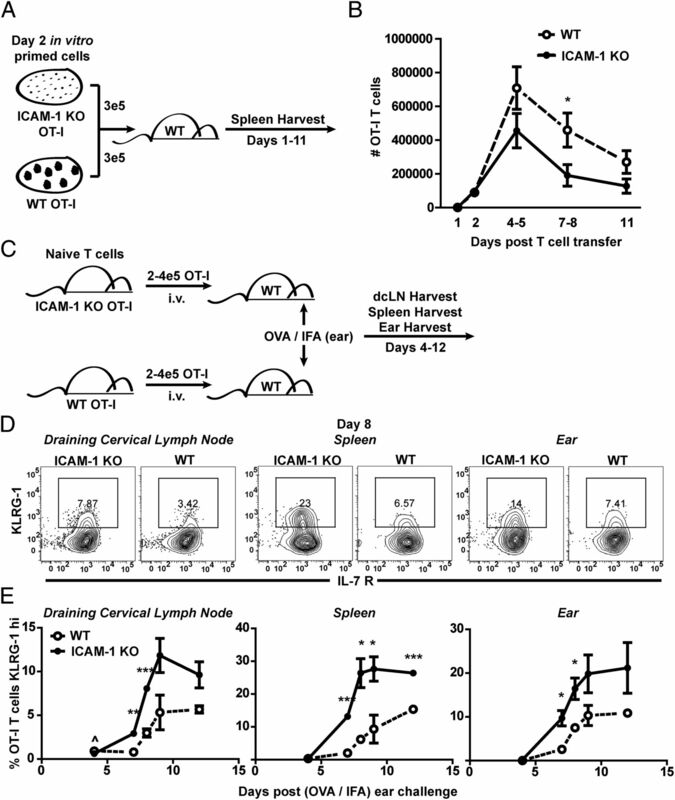 ICAM-1 ligation is not required for IFN-γ regulation, as clustering of ICAM-1–deficient CD8 T cells with wild-type T cells reduces IFN-γ expression. Analysis using a fluorescent reporter that monitors TCR signal strength indicates that T cell clustering limits T cell exposure to Ag during activation. Furthermore, T cell clustering promotes the upregulation of the CTLA-4 inhibitory receptor and the downregulation of eomesodermin, which controls effector molecule expression. Activation of ICAM-1–deficient CD8 T cells in vivo results in an enhanced percentage of KLRG-1+ T cells indicative of short-lived effectors. These results suggest that T cell clustering represents a mechanism that allows continued proliferation but regulates T cell effector function and differentiation. Cytotoxic CD8 T cells are important for the clearance of a multitude of immunological insults ranging from microbes to tumors. The process of CD8 T cell activation consists of recognizing cognate Ag displayed on MHC class I molecules by professional APCs, such as dendritic cells (DCs), in combination with costimulation and an inflammatory cue such as IL-12 (1–4), type I IFN (2, 4–6), or IL-21 (3, 7, 8). Upon stimulation, activated T cells robustly expand many orders of magnitude above the starting precursor frequency. After the peak of the response, a rapid contraction phase proceeds that removes all but 5–10% of the peak population to patrol the host as memory (3, 9–12). The interaction of CD8 T cells with Ag-laden APCs is mediated by the β2 integrin adhesion molecule LFA-1 (αLβ2), which is expressed on T cells and binds to its counterreceptor, ICAM-1, expressed on APCs. Both LFA-1 and ICAM-1 localize to and define the outer region of the immunological synapse (13). In addition, TCR stimulation enhances the interaction of T cells with APCs by rapidly enhancing the functional activity of LFA-1 via inside-out signaling mechanisms (14, 15). Engagement of LFA-1 can also initiate outside-in signaling pathways in T cells (14, 15). Thus, the LFA-1/ICAM-1 adhesion pathway facilitates T cell activation by promoting efficient adhesion of T cells with APCs and transmitting intracellular signals that synergize with TCR-mediated signals to promote T cell proliferation and differentiation. Accordingly, T cells lacking LFA-1 exhibit defects in T cell proliferation, as well as impaired trafficking to lymph nodes because of the loss of critical LFA-1–mediated adhesion that is required for T cell adhesion to high endothelial venules (16). In contrast, analysis of ICAM-1–deficient mice has shown that although ICAM-1 on APCs is not required for normal proliferation and cytotoxicity ability of wild-type CD8 T cells (17, 18), ICAM-1 on APCs is required for facilitating T cell–associated IFN-γ production and memory formation (17, 18). The LFA-1/ICAM-1 interaction also mediates homotypic adhesion between activated T cells, because T cells express both LFA-1 and ICAM-1. Such homotypic aggregates are a hallmark of efficient T cell activation in vitro and T cell clusters have also been observed following Ag-specific T cell activation in vivo (19–25). The functional significance of this Ag-dependent clustering of T cells remains unclear. T cell clusters have been proposed to be critical to the acquisition of IFN-γ and IL-2 from one T cell to another, the latter resulting in IL-2R ligation and subsequent STAT5 phosphorylation (21, 22, 25). Other in vitro studies using human peripheral T cells or T cell lines have shown that anti–ICAM-1 Abs can facilitate CD3-mediated T cell activation. These studies demonstrated that ICAM-1 ligation can protect T cells from apoptosis (26, 27), promote cellular division by downregulating p27kip1 (26) in a manner similar to CD28-mediated costimulation, and enhance CD3-mediated increases in Bcl-2 expression (26), PI3K activation (28), and IL-2/IFN-γ mRNA expression (28). Recent evidence also suggests that CD3/ICAM-1 stimulation can tune the differentiation of CD4 T cells toward a T regulatory phenotype when compared with CD3/CD28 stimulation (29). These studies suggest the possibility that the formation of ICAM-1–mediated homotypic T cell clusters during Ag stimulation may regulate T cell proliferation and differentiation. In the current study, we used an APC-independent CD8 T cell stimulation system to investigate the functional significance of homotypic aggregates during T cell activation. Our results show that ICAM-1 is an early T cell activation marker that is regulated by IL-12 and that the disruption of T cell clusters enhances development of CD8 T cell effector functions by regulating both the access of Ag to activated CD8 T cells, as well as the expression levels of CTLA-4 and eomesodermin. When activated in vivo, the expansion and differentiation profile of ICAM-1–deficient T cells is also altered compared with wild-type T cells and suggests a role for clustering in the differentiation of activated CD8 T cells. OT-I mice expressing a transgenic TCR specific for H-2Kb and the OVA peptide SIINFEKL were crossed to ICAM-1tm1jcgr–deficient mice (30) (The Jackson Laboratory, Bar Harbor, ME), which lack expression of full-length ICAM-1, to produce OT-I ICAM-1–deficient mice. Nur77-GFP OT-I mice were a gift from Dr. K. Hogquist (University of Minnesota) (31). All experimental protocols involving the use of mice were approved by the Institutional Animal Care and Use Committee at the University of Minnesota. C57BL/6NCr recipient mice were purchased from the National Cancer Institute (Bethesda, MD) and The Jackson Laboratory. E.G7 tumor cells (EL-4 thymoma transfected with OVA) were used as targets in in vitro cytotoxicity assays. Directly conjugated fluorescent Abs used include ICAM-1 (clone YN1/1.7.4; eBioscience, San Diego, CA), CD11a (clone M17/4; eBioscience), CD11b (clone M1/70; eBioscience), CD69 (clone H1.2F3; BioLegend, San Diego, CA), CD44 (clone IM7; BioLegend), CD25 (clone PC61; BioLegend), CD212 (clone 114; BD Biosciences, San Jose, CA), programmed death 1 (PD-1) (clone J43; eBioscience), programmed death ligand 1 (PD-L1) (clone MIH5; eBioscience), KLRG-1 (clone 2F1; eBioscience), IL-7R (clone SB/199; BioLegend), IFN-γ (clone XMG1.2; eBioscience), granzyme B (clone GB11; Life Technologies, Grand Island, NY), CTLA-4 (clone UC10-4F10-11; BD Biosciences), and eomesodermin (clone Dan11mag; eBioscience). Cell cultures were maintained in RPMI 1640 supplemented with 10% FCS, 4 mM l-glutamine, 0.1 mM nonessential amino acids, 1 mM sodium pyruvate, 100 U/ml penicillin and streptomycin, 10 mM HEPES, and 5 μM 2-ME (RP-10). Cell surface staining for flow cytometry was performed with ice-cold HBSS supplemented with 2% bovine serum (FACS buffer). Naive wild-type and ICAM-1–deficient OT-I CD8 T cells were purified by negative selection similar to previously described methods (32, 33). Briefly, single-cell suspensions of lymph nodes were incubated with the following FITC-conjugated negatively selecting Abs: anti-CD4, anti-B220, anti–Ter-119, anti–I-Ab, anti-CD16/32, anti-F4/80, and anti-CD44. After washing, the cells were further incubated with anti-FITC microbeads and passed over an LS Column and magnet following manufacturer’s instructions (Mitenyi Biotec, Auburn, CA) to sequester non-CD8 cells. Purity of the flow-through fraction was routinely >95% Vα2+CD8+CD44lo. DCs were enriched from C57BL/6 nontransgenic wild-type or ICAM-1–deficient splenocyte suspensions via positive selection using CD11c microbeads and LS Column and magnet enrichment methods per manufacturer’s instructions (Miltenyi Biotec). Conjugate assays using purified OT-I T cells and purified SIINFEKL-pulsed CD11c+ DCs from C57BL/6 nontransgenic mice were performed similar to previously described methods (34). Briefly, 2 × 105 enriched, peptide pulsed wild-type or ICAM-1–deficient CD11c+ DCs were mixed with 2 × 105 purified wild-type or ICAM-1–deficient OT-I T cells and briefly copelleted into round-bottom plates and allowed to incubate for 5, 10, 30, or 60 min at 37°C. Plates were then spun, supernatants dumped, wells vortexed for 20 s, and cells fixed with 1% paraformaldehyde at room temperature for 20 min. Cells were then washed twice with FACS buffer, and stained with anti-CD8α, anti-Vα2, anti-CD11c, and anti–I-Ab surface Abs. Conjugates were defined by flow cytometry (LSRII; BD Biosciences) as positive for all four markers and expressed as the percentage of the total CD8α/Vα2 population. In vitro activation conditions were designed similar to previous studies (2, 35). DimerX H-2Kb:Ig fusion protein (BD Biosciences) was diluted to 2 μg/ml in PBS and recombinant B7-1/Fc chimeric protein (R&D Systems, Minneapolis, MN) was diluted to 0.4 μg/ml in PBS. Flat-bottom microtiter plates received 50 μl of each reagent and were incubated for 2–3 h at room temperature. Wells were washed twice with sterile PBS and once with RP-10. SIINFEKL peptide was then loaded onto DimerX H-2Kb:Ig fusion protein by adding 100 μl/well at 0.375 μg/ml. Plates were incubated at 37°C for 2–3 h, and then washed several times with RP-10. Purified T cells were added at a concentration of 5 × 104 cells/well in a total volume of 200 μl RP-10 supplemented with 0.05 μg/ml IL-12 (R&D Systems). T cells were blocked in vitro for clustering using endotoxin-free anti–LFA-1 Abs clone M17/4 (eBioscience or BioLegend) and clone M18/2 (BioXCell, West Lebanon, NH) at a final concentration of 2.5 μg/well. Anti–PD-L1 (clone 10F.9G2; BioLegend) (36, 37) blockade of T cells was performed at a final concentration of 10 μg/ml. Anti–CTLA-4 (38) (clone UC10-4F10-11; BD Biosciences) blockade was used at a final concentration of 30 μg/ml. Splenocyte activation of OT-I T cells was performed by harvesting bulk splenocytes from non-transgenic wild-type C57BL/6 mice and plating 3 × 105 splenocytes and Ag with 3 × 105 purified OT-I T cells in 24-well flat bottom plates. The final concentration of SIINFEKL was 1 μg/ml in a total volume of 2 ml RP-10/well. Cell division was determined by prelabeling purified OT-I T cells with 10 μM CFSE prior to plating on Ag-coated plates. Viable cell counts were determined using trypan blue exclusion in combination with a Countess Automated Cell Counter (Life Technologies) according to the manufacturer’s instructions. Cell viability was assessed using 10 μl 7-aminoactinomycin D (eBioscience) per sample and staining for 10 min on ice prior to sampling by flow cytometry. Cytotoxicity was measured as previously described (35) using 51Cr-pulsed E.G7 thymoma cells as target cells and day 3 in vitro–activated effector T cells. Briefly, 1 × 105 target cells were plated into 96-well V-bottom plates, and then, a 3-fold serial dilution of activated T cells were added to each well in a total volume of 200 μl. Plates were briefly spun and incubated at 37°C for 3–4 h. After the incubation, plates were spun, and supernatants recovered to assess killing by a gamma counter. Each E:T ratio was performed in triplicate and percent lysis was calculated as follows: ([mean of triplicate wells − spontaneous]/[total − spontaneous]) × 100%. Cells were harvested from plates, washed with FACS buffer, stained with surface marker Abs, and analyzed on a LSRII or FACSCalibur. Activated Nur77-GFP OT-I T cells were harvested, washed, and analyzed using flow cytometry. Intracellular staining for IFN-γ (1:100 dilution), granzyme B (1:50 dilution), and CTLA-4 (1:100 dilution) was performed using the BD Cytofix/Cytoperm kit (BD Biosciences). Briefly, T cells were stained with surface Abs, washed with FACS buffer, fixed with 250 μl BD Cytofix/Cytoperm, and stored at 4°C for 20 min. Cells were then washed twice with 1× BD Perm/Wash buffer, intracellular staining Abs added, and cells stored at 4°C for 30–60 min. Cells were then washed twice with 1× BD Perm/Wash buffer and resuspended in FACS buffer for flow cytometry. Eomesodermin (1:100 dilution) staining was performed using the Foxp3 staining buffer set (eBioscience). Briefly, T cells were stained with surface Abs, washed with FACS buffer, and resuspended in 1 ml fresh Fixation/Permeabilization working solution for 30 min at 4°C. Cells were then washed twice with 1 ml 1× permeabilization buffer and eomesodermin Ab added and samples stored for 60 min at 4°C. Cells were washed twice with 1 ml 1× permeabilization buffer and resuspended in FACS buffer for flow cytometry. Expansion and maintenance of activated T cells was performed similar to previous methods (2). Specifically, 3 × 105 wild-type and 3 × 105 ICAM-1–deficient day 2 in vitro–activated OT-I T cells were coadoptively transferred i.v. into congenically different naive recipient mice. Expansion and maintenance in the spleen was monitored between days 1 and 11 posttransfer. In vivo activation of T cells was performed by adoptively transferring 2–4 × 105 naive wild-type or ICAM-1–deficient OT-I T cells into different recipients and stimulating one day later with 3 μg OVA protein emulsified in IFA (10 μl volume using an insulin syringe) s.c. in the ear. Draining cervical lymph node, spleen, and ear tissue was harvested between days 4 and 12 and OT-I T cells were assessed for KLRG-1 expression. Images of activated T cells were taken with an inverted Olympus FluoView 1000 confocal microscope with a ×10 dry lens. In several experiments, live content imaging and analysis was performed with an IncuCyte ZOOM imager (Essen Bioscience, Ann Arbor, MI). Images were taken with a ×10 objective lens every two hours. IncuCyte Zoom software was used to automatically score and quantify cluster formation. Clusters were defined as cell aggregates occupying an area at least 2000 μm2 and an eccentricity (noncircularity) of <0.8 and were expressed as the number of clusters per square millimeter. Four different locations were imaged in each well over the entire time course and clustering analysis was dependent on the quantification of at least 8–16 total movies. Coclustering analysis was performed using ImageJ analysis software version 1.47n (National Institutes of Health, Bethesda, MD) to enumerate the total number of CellTrace Violet (Life Technologies) labeled ICAM-1–deficient T cells. T cell labeling was performed per manufacturer’s instructions. The number of labeled cells not involved in clusters was then counted to determine the percentage of ICAM-1–deficient T cells in wild-type clusters using the following equation: ([total number of ICAM-1–deficient T cells − number of ICAM-1–deficient T cells not in clusters]/[total number of ICAM-1–deficient T cells]) × 100%. ICAM-1–deficient T cells were considered to be part of a wild-type cluster if the cell was involved in an interaction directly with a wild-type T cell or if the ICAM-1–deficient T cell was in a cluster containing a wild-type T cell. Graphpad Prism version 5.03 software (GraphPad Software, La Jolla, CA) was used to determine statistical significance using Student unpaired two-tailed t test. For statistics using normalization of ICAM-1–deficient values to wild-type values, statistics were performed using a normalized value = 1. The p value cutoffs and notation were used as follows (unless otherwise denoted): *p < 0.05, **p < 0.01, and ***p ≤ 0.0008. The interaction of T cells with APCs is dependent on the LFA-1 integrin expressed on T cells interacting with the ligand ICAM-1 expressed on APCs (17, 18, 39). However, because T cells and CD11c+I-Ab+ DCs express both LFA-1 and ICAM-1 (Fig. 1A, 1B) (40–42), it is formally possible that ICAM-1 expressed on T cells may facilitate T cell:DC contacts during Ag recognition by binding LFA-1 expressed on DCs. We used ICAM-1–deficient OT-I T cells and ICAM-1–sufficient wild-type or ICAM-1–deficient CD11c+ DCs to examine the contribution of ICAM-1 expressed on either the T cell or DC for Ag-dependent T cell:DC conjugate formation. Wild-type CD8 OT-I T cells specific for the OVA peptide SIINFEKL interact in an Ag dose-dependent manner with both wild-type and ICAM-1–deficient SIINFEKL-pulsed DCs (Fig. 1C). However, when compared with wild-type DCs, wild-type OT-I T cells exhibit dramatically impaired ability to interact with ICAM-1–deficient DCs at all Ag doses tested (Fig. 1C). This is consistent with T cell:DC interactions being highly dependent on LFA-1 expressed on the T cell and ICAM-1 expressed on the Ag-pulsed DC (17, 18, 39). Furthermore, the loss of ICAM-1 on the OT-I T cell did not affect the ability of OT-I T cells to interact with wild-type Ag-pulsed DCs at any of the Ag concentrations tested (Fig. 1D) or at multiple time points following activation (Fig. 1E). This suggests that ICAM-1 expression on T cells is not critical for stable CD8 T cell contacts with Ag-laden DCs. ICAM-1 is dispensable on T cells for mediating stable interactions with DCs. Expression of ICAM-1 and LFA-1 α-subunit (CD11a) on naive wild-type (wt) (dashed histograms) and ICAM-1 knockout (iKO) (solid black histograms) OT-I T cells (A), and C57BL/6 wt (dashed histograms) and iKO (solid black histograms) CD11c+I-Ab+ DCs. Isotype control staining is shown in shaded histograms (B). (C) Conjugate efficiency assessed between wt OT-I T cells and CD11c+ wt DCs (□) or CD11c+ iKO DCs (▪) pulsed with the indicated amounts of SIINFEKL peptide and incubated together for 10 min. Data are pooled from two independent experiments. *p < 0.05, **p < 0.01. (D) Conjugate efficiency assessed between wt (□) or iKO (▪) OT-I T cells and incubated for 10 min with wt DCs pulsed with the indicated amounts of SIINFEKL peptide. Data are pooled from three independent experiments. (E) Conjugate efficiency assessed between wt (□) or iKO (▪) OT-I T cells and incubated for 5–60 min with wt DCs prepulsed with 30 nM SIINFEKL. To explore the functional significance of T cell:T cell contacts during prolonged Ag exposure, we used a well-characterized APC-free in vitro stimulation system where efficient activation and differentiation of Ag-specific CD8 T cells is associated with robust T cell clustering. In this system, OT-I T cells are stimulated with immobilized purified H-2Kb pulsed with SIINFEKL peptide, immobilized recombinant B7-1, and the inflammatory cytokine IL-12 (2, 35). The presence of IL-12 is critical for differentiation of naive CD8 T cells into cytotoxic T cells capable of expressing effector molecules, mediating target cell killing, and promoting memory (3). IL-12 also enhanced wild-type OT-I T cell clusters that were observed 48 h after activation (Fig. 2A, 2B). Enhanced expression of LFA-1 was detected within 24 h after activation, a time point when the OT-I T cells have not yet begun to divide. LFA-1 expression increased further at 48 h and stayed stable at 72 h after activation (Fig. 2C). Another leukocyte-specific ICAM-1 binding integrin, Mac-1 (αMβ2), was not expressed on naive OT-I T cells and was not upregulated on either wild-type or ICAM-1–deficient OT-I T cells during the 3-d activation time course (Supplemental Fig. 1A). ICAM-1 upregulation was also observed 24 and 48 h after activation but then began to decline at 72 h poststimulation (Fig. 2D). ICAM-1 upregulation began as early as 5-h poststimulation (data not shown). Although the addition of IL-12 did not affect the changes in LFA-1 expression on T cells, IL-12 enhanced and sustained the expression of ICAM-1 at 48 and 72 h post-T cell activation. IL-12 induces T cell clustering but has differential effects on the expression of LFA-1 and ICAM-1. (A) Images of highly purified wild-type (wt) OT-I T cells after 2 d of activation with immobilized Ag and B7-1 in the absence (upper image) or presence (lower image) of IL-12. (B) Quantification of ratios of clusters to individual T cells in the absence or presence of IL-12. ***p = 0.0008. Kinetics of LFA-1 α-subunit (CD11a) (C) and ICAM-1 expression (D) on purified wt naive and activated OT-I T cells. Expression of LFA-1 and ICAM-1 on T cells activated in the presence or absence of IL-12 is shown at each time point. Shaded histograms represent isotype control staining. Geometric mean fluorescence intensity values for expression in the absence of IL-12 (italics) or in the presence of IL-12 (black) are shown in each panel. Data are representative of one experiment from at least three independent experiments. We next examined the clustering and activation response of ICAM-1–deficient T cells. In contrast to wild-type OT-I T cells, ICAM-1–deficient OT-I T cells failed to aggregate following in vitro stimulation with Ag, B7-1, and IL-12 (Fig. 3A, 3B). As a complementary approach, we also examined the clustering response of wild-type OT-I T cells activated in the presence of the LFA-1 (CD11a) specific Ab M17/4 (43), which blocks T cell clusters (Fig. 3C), or the LFA-1 (CD18) specific Ab M18/2 (43), which does not inhibit LFA-1–mediated clusters (Fig. 3D). Quantification shows high levels of clustering with the wild-type untreated (Fig. 3E), as well as the wild-type M18/2–treated conditions (Fig. 3G), whereas the ICAM-1–deficient T cells and the wild-type M17/4–treated T cells showed comparable negligible levels of clustering (Fig. 3F). ICAM-1 deficiency and anti–LFA-1 integrin blockade inhibit the formation of T cell activation clusters. (A‑D) Images taken using an IncuCyte ZOOM live imager of highly purified wild-type (wt), ICAM-1 deficient (iKO), wt + M18/2 anti–LFA-1 Ab, and wt + M17/4 anti–LFA-1 Ab OT-I T cells after 1 and 2 d of activation with Ag, B7-1, and IL-12. Scale bar (0–300 μm) present in lower left corner of (A). (E‑G) Quantification of time course images taken in (A) every 2 h was performed as described in Materials and Methods. The number of clusters per square millimeter is shown for n = 8–16 total movies. *p < 0.05, **p < 0.01, ***p ≤ 0.0002. We next examined the activation response of ICAM-1–deficient T cells. The lack of clustering shown in Fig. 3B does not alter the proliferation of ICAM-1–deficient OT-I T cells as evidenced by similar dilution of CFSE to wild-type OT-I T cells (Fig. 4A). In addition, the overall expression kinetics of key T cell activation markers (CD44, CD69, and CD25), as well as the IL-12R were similar among wild-type and ICAM-1–deficient T cells postactivation (Fig. 4B). Furthermore, wild-type and ICAM-1–deficient OT-I T cells displayed similar high levels of cell viability and low levels of death in vitro as assessed by trypan blue exclusion (data not shown) and 7-aminoactinomycin D staining at days 2 and 3 of activation (Supplemental Fig. 1B). We also observed comparable T cell division among the wild-type anti–LFA-1–treated conditions compared with wild-type untreated as evidenced by the recovery of OT-I T cells at each day in culture (Fig. 4C). ICAM-1 deficiency does not alter in vitro activation of CD8 T cells or expression of activation markers. (A) CFSE dye dilution of wild-type (wt) (gray) and ICAM-1 deficient (iKO) (black) OT-I T cells that were unstimulated or stimulated for 1–3 d with Ag, B7-1, and IL-12. (B) Expression of CD44, CD69, CD25, and IL-12R (CD212) on wt OT-I T cells (shaded histograms) and iKO OT-I T cells (black histograms) after stimulation with Ag, B7-1, and IL-12. (C) Recovery of wt OT-I T cell (solid line) and wt OT-I T cell + anti–LFA-1 Ab treatments (M17/4, long dashes; M18/2, short dashes) after in vitro activation with Ag, B7-1, and IL-12. Data are pooled from at least three independent experiments. We next sought to determine whether the absence of clustering played a role in effector molecule production. 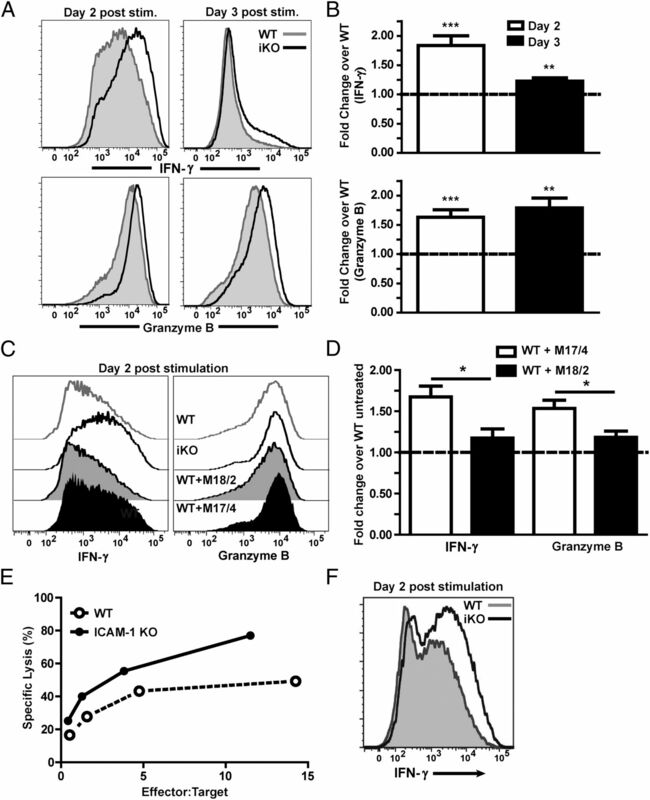 Compared with wild-type OT-I T cells, ICAM-1–deficient OT-I T cells displayed enhanced expression (1.5- to 2-fold) of both IFN-γ and granzyme B at days 2 and 3 postactivation (Fig. 5A). Quantification of fold increases in effector molecule expression for ICAM-1–deficient T cells compared with wild-type T cells was statistically significant (Fig. 5B). Consistent with our finding using ICAM-1–deficient OT-I T cells, inhibition of clustering of wild-type OT-I T cells during in vitro activation with the inhibitory anti–LFA-1 Ab M17/4 resulted in elevated expression of IFN-γ and granzyme B at 2 d of prolonged Ag exposure (Fig. 5C). In contrast, the M18/2 Ab did not disrupt clustering of wild-type OT-I T cells and did not alter effector molecule expression when compared with untreated wild-type T cells (Fig. 5C). Quantification of fold changes in effector molecule production over wild-type untreated conditions was significant (Fig. 5D). Blocking LFA-1 on ICAM-1–deficient OT-I T cells with M17/4 did not alter IFN-γ expression compared with untreated ICAM-1–deficient T cells (Supplemental Fig. 1C), suggesting the Ab treatment was nonstimulatory. ICAM-1–deficient T cells have enhanced effector function after stimulation. 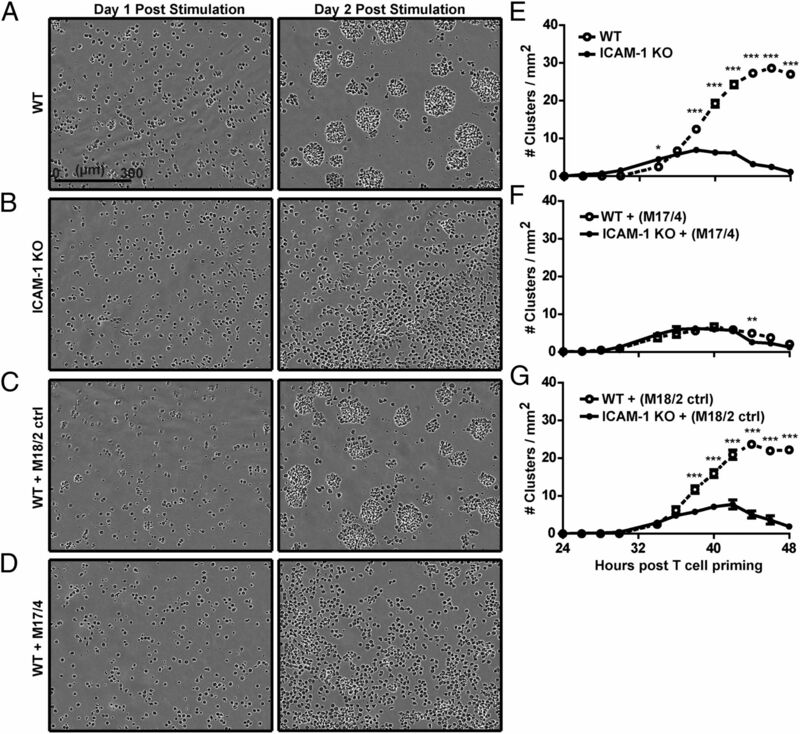 (A) Expression of IFN-γ and granzyme B in wild-type (wt) (shaded histograms) and ICAM-1–deficient (iKO) (black histograms) OT-I T cells 2 and 3 d poststimulation with Ag, B7-1, and IL-12. (B) IFN-γ and granzyme B expression (median fluorescence intensity values) by activated iKO OT-I T cells normalized to expression by wt OT-I T cells at days 2 (n ≥ 15 independent experiments) and 3 (n ≥ 6 independent experiments) poststimulation. **p ≤ 0.008, ***p ≤ 0.0002. (C) wt OT-I T cells, iKO OT-I T cells, and wt OT-I T cells treated with the anti–LFA-1 integrin Abs M18/2 or M17/4 were activated with Ag, B7-1, and IL-12. IFN-γ and granzyme B expression was assessed by flow cytometry 2 d after stimulation. (D) Fold change in IFN-γ and granzyme B expression (median fluorescence intensities) as shown in (C) using wt OT-I T cells activated in the presence of the M17/4 or M18/2 Abs normalized to the expression by untreated activated wt OT-I T cells (n = 4 independent experiments). *p < 0.05. (E) Cytolytic activity of day 3 activated wt and iKO OT-I T cells determined using a standard 51Cr release assay with EG.7 OVA target cells. Results shown are one experiment representative of greater than three independent experiments. (F) IFN-γ expression by wt and iKO OT-I T cells 2 d poststimulation with nontransgenic wt splenocytes and SIINFEKL peptide. Data are from one of three independent experiments. To assess whether the increased expression of effector molecules when clustering was reduced was functionally relevant, we performed an in vitro killing assay. Three-day activated ICAM-1–deficient OT-I T cells had an enhanced ability to kill EG7-OVA target cells compared with control 3-d activated wild-type OT-I T cells (Fig. 5E). We also examined effector molecule production by purified wild-type and ICAM-1–deficient OT-I T cells after activation by Ag and wild-type splenocytes. Similar to our results with the APC-free system of Ag, B7-1, and IL-12, stimulation with Ag and splenocytes resulted in a modest increase in IFN-γ expression by the ICAM-1–deficient T cells compared with wild-type T cells (Fig. 5F). These results suggest that ICAM-1–mediated homotypic clustering negatively regulates CD8 T cell effector molecule production and cytotoxicity. We next examined the response of ICAM-1–deficient OT-I T cells under conditions in which these cells were activated in the presence of varying amounts of wild-type OT-I T cells. Under these mixed culture conditions, ICAM-1–deficient OT-I T cells would be capable of interacting with wild-type OT-I T cells via LFA-1 on ICAM-1–deficient OT-I T cells interacting with ICAM-1 expressed on wild-type OT-I T cells. When ICAM-1–deficient OT-I T cells were in excess (90% ICAM-1–deficient OT-I to 10% wild-type OT-I), only a small percentage of the total number of ICAM-1–deficient OT-I T cells in the culture well were found to be in clusters (Fig. 6B). When we increase the percentage of wild-type OT-I T cells in the culture well, an increased percentage of ICAM-1–deficient OT-I T cells were found in clusters because there are more OT-I T cells, both wild-type and ICAM-1–deficient, capable of interacting with each other (Fig. 6B). Thus, by varying the percentage of wild-type and ICAM-1–deficient OT-I T cells in the culture well, we were able to vary the total percentage of ICAM-1–deficient T cells in clusters. Congenic markers were used to identify the two T cell populations to simultaneously assess IFN-γ expression in the mixed cultures 2 d postactivation with Ag, B7-1, and IL-12. Under conditions with the lowest percentage of ICAM-1–deficient T cells in clusters (90% ICAM-1–deficient OT-I to 10% wild-type OT-I), IFN-γ production was elevated in the ICAM-1–deficient T cells compared with wild-type T cells in the same culture. However, as increasing amounts of wild-type OT-I T cells were titrated into the cultures, resulting in an increasing percentage of ICAM-1–deficient T cells in clusters, the IFN-γ expression in ICAM-1–deficient OT-I T cells declined to levels nearly observed in wild-type OT-I T cells (Fig. 6A). In contrast, the presence of differing numbers of ICAM-1–deficient OT-I T cells did not alter IFN-γ expression in wild-type OT-I T cells nearly as much as it did in the ICAM-1 deficient population (Fig. 6A). These results suggest that homotypic aggregation of OT-I T cells is sufficient to dampen IFN-γ expression following Ag stimulation and does not require ICAM-1 ligation on CD8 T cells. ICAM-1–deficient T cells coclustered with wild-type (wt) T cells leads to reduced IFN-γ production. 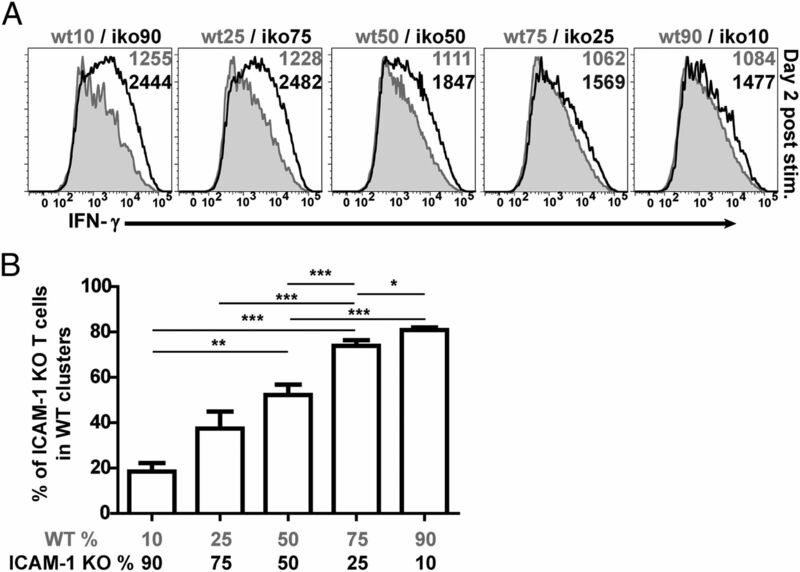 (A) IFN-γ expression was assessed in wt (shaded histogram) and ICAM-1–deficient (iKO) (black histogram) OT-I T cells activated for 2 d with Ag, B7-1, and IL-12. The ratio of wt OT-I T cells to iKO OT-I T cells varied from 10% of the starting population (left panel) to 90% of the starting population (right panel). The starting number of T cells in each well was maintained at 5 × 104 cells/well. wt and iKO OT-I T cells in the same culture were identified by flow cytometry using congenic markers. Median fluorescence intensities for wt (gray) and iKO (black) T cells are shown in the upper right hand corner of each plot. Data are from one experiment that is representative of three independent experiments. (B) Quantification of the percentage of CellTrace Violet–labeled iKO T cells in contact with wt T cell clusters. Images from at least two independent experiments (n = 3–10 images) were used. *p < 0.05, **p < 0.01, ***p < 0.0002. Because enhanced T cell effector function has been associated with increased Ag levels and TCR stimulation (10, 44, 45), we hypothesized that the elevated effector function observed when CD8 T cells are blocked may be a result of increased Ag exposure that results in enhanced TCR signaling. 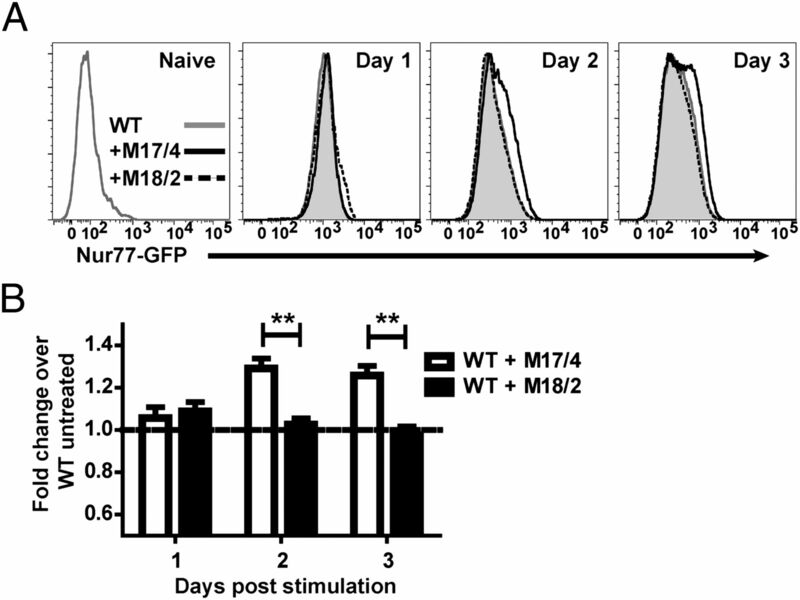 We stimulated OT-I T cells expressing a Nur77-GFP reporter and blocked T cell clusters using the M17/4 anti–LFA-1 Ab. The level of GFP expressed in T cells expressing the Nur77-GFP reporter has been shown to be directly correlated with the strength of TCR signal received by the T cells, independent of both inflammation and costimulation (31). As expected, naive OT-I T cells showed minimal GFP expression in the absence of stimulation (Fig. 7A). However, increased GFP expression in wild-type OT-I T cells was observed within 24 h following Ag stimulation and was maintained at 48 and 72 h postactivation (Fig. 7A). The addition of the noninhibitory anti-LFA-1 Ab M18/2 did not alter GFP expression in OT-I T cells compared with wild-type OT-I T cells activated in the absence of Ab. However, when OT-I T cell clusters were blocked with the M17/4 anti–LFA-1 Ab, we observed a ∼1.3-fold increase in GFP expression that was detectable after 48 h of stimulation and maintained at 72 h (Fig. 7A). Fold changes between the anti–LFA-1–treated conditions normalized to wild-type untreated were statistically significant (Fig. 7B). This increase in GFP expression occurs at a time when the T cells are aggregating in vitro (Fig. 3). This result suggests that homotypic aggregation of CD8 T cells during activation reduces exposure of T cells to Ag. Increased Ag sensing by unclustered T cells. (A) Kinetics of GFP expression in wild-type (wt) GFP-Nur77 OT-I T cells activated for 1–3 d with Ag, B7-1, and IL-12 in the absence (shaded histograms) or presence of the anti–LFA-1 Abs M17/4 (black histograms) or M18/2 (dotted histograms). Expression of GFP in unstimulated naive GFP-Nur77 OT-I T cells is shown in the far left panel. (B) Fold change in GFP expression in wt OT-I T cells activated in the presence of anti–LFA-1 Abs M17/4 (□) or M18/2 (▪) normalized to expression in untreated activated wt OT-I T cells. Graph shows data pooled from three independent experiments. **p < 0.01. Although the elevated effector function of unclustered or ICAM-1–deficient T cells may be partially explained by enhanced Ag sensing, it remains plausible that this is not the only role for T cell activation clusters. For example, the coclustering of activated CD8 T cells during prolonged Ag exposure could result in the transmission of negative regulatory signals mediated by the engagement of receptors with counterreceptors other than LFA-1 and ICAM-1. We explored the possibility that the reduced IFN-γ expression associated with homotypic aggregation of OT-I T cells during activation might be mediated by PD-1, which is known to become expressed on activated T cells (46, 47) and can negatively regulate TCR stimulation (47). Consistent with previous studies, we demonstrated that our activation conditions resulted in a rapid but transient upregulation of PD-1 (Supplemental Fig. 2B) and the PD-1 counterreceptor PD-L1 (Supplemental Fig. 2A). However, there were no differences in the expression kinetics of either protein between wild-type and ICAM-1–deficient OT-I T cells. Treating both the wild-type and ICAM-1–deficient OT-I T cells with an established anti–PD-L1 blocking Ab (36, 37) did not alter IFN-γ expression following T cell activation (Supplemental Fig. 2C). Another inhibitory molecule that can become upregulated on T cells is CTLA-4, which binds to both CD80 and CD86, and dampens effector responses (48–50). Thaventhiran et al. (51) recently demonstrated that titrating unactivated T cells into cultures of activated T cells led to the downregulation of CTLA-4 both on the surface and intracellularly. In our activation system, we observed elevated expression of surface and intracellular (permeabilized) CTLA-4 in wild-type OT-I T cells at 48 h after stimulation (Fig. 8A). In contrast, activated ICAM-1–deficient OT-I T cells expressed lower levels of CTLA-4, both on the surface and after permeabilization (Fig. 8A). In addition, blocking CTLA-4 function with an anti–CTLA-4 Ab (38) resulted in increased IFN-γ production by wild-type T cells but not by ICAM-1–deficient T cells (Fig. 8B, 8C). T cell activation clusters regulate CTLA-4 and eomesodermin expression. (A) Wild-type (wt) and ICAM-1–deficient (iKO) OT-I T cells were activated with Ag, B7-1, and IL-12 for 2 d and assessed for surface (left panel) and intracellular/permeabilized CTLA-4 (right panel) expression. Median fluorescence intensity values for each plot are shown in parentheses. Isotype (iso) staining is shown in gray and CTLA-4 staining in black. Data shown are from one experiment representative of at least three independent experiments. (B) wt and iKO OT-I T cells were stimulated as above but in the presence of 30 μg/ml anti–CTLA-4 blocking Ab and assessed for IFN-γ production. Untreated samples are shown with gray histograms and anti–CTLA-4–treated samples are depicted with black lines. Median fluorescence intensities are shown in the upper right corner. (C) Quantification of fold changes in IFN-γ expression by the anti–CTLA-4–treated samples normalized to the untreated samples as shown in (B). Data are from at least two independent experiments pooled together. *p < 0.05. (D) wt (dashed line) and iKO (solid line) OT-I T cells were stimulated with Ag, B7-1, and IL-12 for 2 d and assessed for intracellular eomesodermin (Eomes) transcription factor expression. Isotypes are shown in gray dashed (wt) and gray shaded (iKO) histograms. Geometric mean fluorescence intensities are shown in parentheses in the upper right corner. (E) Quantification of fold change in Eomes expression in the iKO OT-I T cells when normalized to wt expression for three independent experiments. p = 0.0864. CTLA-4 has been shown to regulate IFN-γ on CD8 T cells (52) via the repression of the transcription factor eomesodermin (Eomes) (53, 54), which can affect effector capabilities and differentiation of CD8 T cells (55). Thus, we examined Eomes expression levels on day 2 activated wild-type and ICAM-1–deficient T cells. Unclustered activated ICAM-1–deficient OT-I T cells displayed increased expression levels of Eomes compared with wild-type OT-I T cells (Fig. 8D), with an average fold change of ∼1.6 relative to wild-type (Fig. 8E). Taken together, these results indicate that increased effector molecule expression that occurs when T cell clusters are disrupted is associated with changes in CTLA-4 and Eomes expression. The Eomes transcription factor has been linked to CD8 T cell effector capabilities (55) and can work in combination with T-bet to promote cytotoxicity (56) and effector/memory differentiation (57). To examine the impact of modulating T cell clustering on subsequent T cell responses, we activated wild-type and ICAM-1–deficient OT-I T cells for 2 d with Ag, B7-1, and IL-12 and then coadoptively transferred 3 × 105 of each cell population into naive wild-type nontransgenic recipients (Fig. 9A). Similar to what has been reported in previous studies (2), wild-type OT-I T cells exhibited Ag-independent expansion in the spleen for several days after transfer into naive hosts that was followed by a contraction phase. In contrast, the number of ICAM-1–deficient T cells at the peak of expansion and in the contraction phase was lower than wild-type T cells (Fig. 9B). This result suggests that clustering during prolonged Ag exposure in vitro regulates subsequent in vivo expansion and maintenance capacities of T cells. ICAM-1–deficient T cells show signs of impaired expansion and increased differentiation in vivo. (A) Schematic model of experimental setup of coadoptively transferred activated T cells. Specifically, 3 × 105 wild-type (wt) and 3 × 105 ICAM-1–deficient (iKO) OT-I T cells activated in vitro for 2 d with Ag, B7-1, and IL-12 were coadoptively transferred into wt nontransgenic naive recipients. Naive recipient mice were sacrificed at indicated time points, and spleens were harvested for OT-I T cell quantification. (B) T cell curve showing Ag-independent expansion and contraction of wt (dashed line) and iKO (solid line) OT-I T cells between 1 and 11 d post-coadoptive transfer. Data are pooled from at least four experiments. Day 1 (n ≥ 2), day 2 (n = 10), days 4–5 (n = 11), days 7–8 (n = 7), and day 11 (n = 5). *p < 0.05. (C) Schematic model of experimental setup of adoptive transfer of naive OT-I T cells with subsequent in vivo activation. Briefly, 2–4 × 105 naive wt or iKO OT-I T cells were i.v. transferred into separate naive C57BL/6 recipients. One day later, mice were anesthetized and injected with 3 μg OVA protein emulsified in IFA into the ear pinna. Mice were sacrificed, and tissues were harvested ∼4–12 d post-OVA/IFA challenge. (D) Representative examples of KLRG-1 and IL-7R staining for iKO and WT OT-I T cells harvested from the draining cervical lymph node, spleen, and ear at day 8 postchallenge. (E) Quantification of KLRG-1+ wt (dashed line) and iKO (solid line) OT-I T cells from days 4–12 post ear challenge in the draining cervical lymph node, spleen, and ear. These data are from one experiment (n = 3 mice for each time point) that is representative of at least four independent experiments. *p < 0.05, **p < 0.01, ***p ≤ 0.0008, ^p < 0.05 (for wt). To determine whether ICAM-1–deficient T cells display a more differentiated phenotype after in vivo activation, we transferred high precursor frequencies (2–4 × 105) of ICAM-1–deficient or wild-type OT-I T cells into wild-type naive recipient mice (Fig. 9C) and challenged 1 d later with OVA protein emulsified in IFA in the ear. We transferred high numbers of precursors to dampen the wild-type (ICAM-1 sufficient) endogenous response (58, 59). At various time points after challenge, we examined expression of KLRG-1, a cell surface marker indicative of terminally differentiated short-lived effector T cells (60). When compared with wild-type OT-I T cells, ICAM-1–deficient OT-I T cells primed in vivo and assessed for KLRG-1 expression showed an increase in the percentage of KLRG-1+ T cells at nearly all time points in all tissues examined (draining cervical lymph node, spleen, and ear) (Fig. 9D, 9E). These results suggest that ICAM-1–deficient CD8 T cells exhibit a more terminally differentiated phenotype compared with wild-type CD8 T cells in vivo. Activation of T cells both in vitro and in vivo results in the formation of homotypic T cell clusters (19–24, 61). These T cell clusters are mediated by the LFA-1 integrin and the LFA-1 counterreceptor ICAM-1, and screening assays assessing the ability of monoclonal Abs to block homotypic aggregation led to the identification of this receptor/counterreceptor interaction (20). However, the functional significance of this activation-induced aggregation of T cells remains unclear. In this study, we find that disrupting T cell clusters during activation does not affect proliferation but instead results in elevated CD8 T cell effector function and differentiation that is associated with enhanced sensing of Ag and differential regulation of CTLA-4 and eomesodermin (Eomes). Ab-mediated ligation of ICAM-1 on human T cells enhances CD3-mediated T cell activation in a manner similar to anti-CD28 Ab-mediated costimulation. 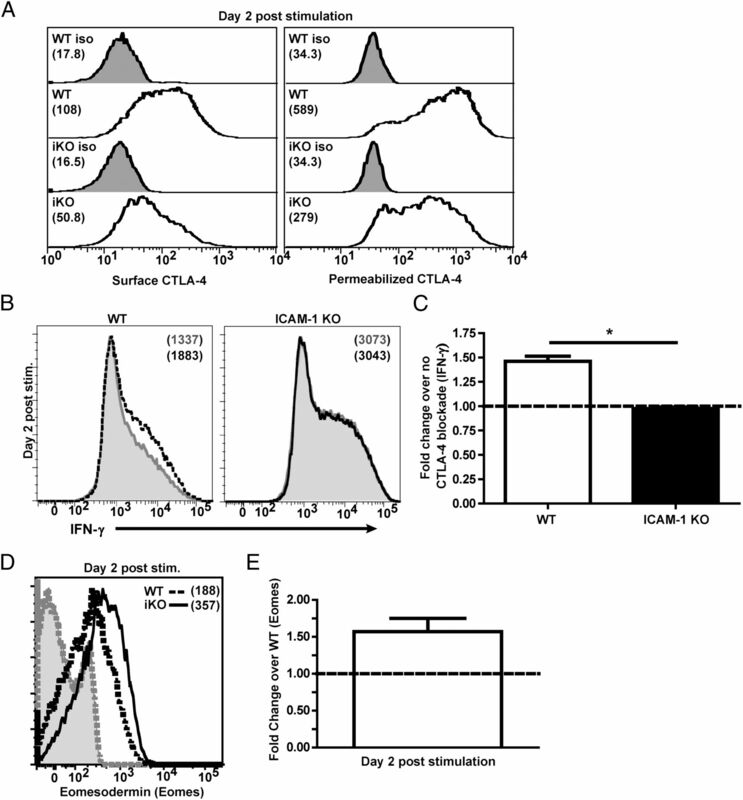 This costimulatory effect of ICAM-1 has been associated with a number of downstream signaling responses in T cells (26–29), suggesting the possibility that ICAM-1 may be capable of transmitting an intracellular signal upon engagement with LFA-1. A signaling role for ICAM-1 during T cell activation is also supported by other studies using endothelial cells and Raji cells demonstrating a signaling function for the ITIM in the ICAM-1 cytoplasmic domain (62, 63). These previous studies suggest the possibility that in our system the disruption of T cell clusters may ablate ICAM-1–mediated signals induced by engagement of LFA-1 expressed on other activated CD8 T cells. However, our observation that ICAM-1–deficient CD8 T cells can exhibit reduced IFN-γ expression when clustered with wild-type CD8 T cells suggests that ICAM-1 expression is not necessarily required to dampen CD8 T cell effector function. It is important to note that the ICAM-1–deficient OT-I T cells used in our studies (30) lack expression of full-length ICAM-1 but have been shown to express splice variant isoforms (64–66). These isoforms could theoretically interact with LFA-1 on another T cell to transduce a signal even though the ligation is not strong enough to allow for sustained cluster formation of ICAM-1–deficient T cells. Alternatively, it is possible that full-length ICAM-1 initiates a signal that inhibits the expression of effector molecules such as IFN-γ and granzyme B on wild-type T cells. Subsequently, when full-length ICAM-1 is ablated, as occurs in the ICAM-1–deficient T cells, this putative inhibitory signal may be lost. In addition to ICAM-1–mediated signaling, homotypic T cell clusters may result in the delivery of soluble signals that regulate T cell activation and differentiation. IL-2 can be synaptically acquired by CD4 T cells when they are interacting in homotypic aggregates (21, 22). In addition, differentiation of CD8 T cells has been proposed to be regulated by IFN-γ that is secreted between T cell–T cell contacts (25). Although IL-2 is essential for optimal proliferation and survival of CD8 T cells following Ag challenge in our in vitro system (2, 35), we did not observe differences in initial T cell expansion between clustered and unclustered T cells. The addition of exogenous IL-2 also did not alter the proliferation of ICAM-1–deficient CD8 T cells, suggesting that these unclustered T cells were not lacking in IL-2 signals required for optimal T cell activation. The enhanced expression of the GFP-Nur77 reporter (31) in unclustered activated CD8 T cells suggests that another function of homotypic aggregation during T cell activation may be to attenuate T cell responses by limiting T cell access to Ag. The association between enhanced IFN-γ expression in ICAM-1–deficient OT-I T cells and clustering in culture with differing ratios of wild-type and ICAM-1–deficient OT-I T cells is consistent with this model. We speculate that during a T cell response to Ag in vivo, homotypic clustering observed around DCs during T cell activation may regulate T cell responses that result in differing levels of access to Ag. In addition, such clustering would limit T cell motility in vivo, thus reducing the likelihood that an activated T cell would be able to encounter other Ag-laden DCs. In both instances, the outcome is an attenuation of the total Ag signal received by the T cell. Thus, this clustering response may play a role in subsequent differentiation programs for activated CD8 T cells, which have been shown to be dependent in part on the strength of the Ag signal received by a responding naive T cell (9, 10, 44). We also explored the possibility that T cell clustering might regulate the expression of inhibitory receptors that would then attenuate T cell differentiation. Our results revealed that disruption of T cell clustering during activation attenuated the activation-induced upregulation of CTLA-4 inhibitory receptor. This is similar to recent results demonstrating CTLA-4 downregulation when activated OT-I CD8 T cells are cultured with resting polyclonal CD8 T cells (51). Because CTLA-4 on CD8 T cells can modulate effector functions (52), such as IFN-γ and granzyme B production, by repressing Eomes (53, 54), we hypothesized that the elevated expression of effector molecules in activated unclustered T cells would be associated with increased Eomes expression. Consistent with the enhanced effector profile when clusters were disrupted during prolonged Ag exposure, ICAM-1–deficient T cells expressed elevated levels of Eomes. Interestingly, clustering altered activation-dependent upregulation of CTLA-4 but not two other inhibitory receptors, PD-1 and PD-L1. This suggests that clustering does not globally regulate the expression of inhibitory receptors. In our activation system, there are two sources of CTLA-4 ligands: the purified B7-1 immobilized on the plate with H2-Kb and Ag, and low levels of expression of both CD80 and CD86 on the activated T cells (data not shown). The relative contribution of these CTLA-4 ligands to cluster-dependent regulation of CD8 T cell differentiation is currently being investigated. It is interesting to note that the presence of IL-12 in our activation conditions is associated with the most robust T cell clusters and sustained expression of ICAM-1 following activation. IL-12 is crucial for optimal CD8 T cell effector function and clonal expansion (3, 4) and regulates the expression levels of a variety of CD8 T cell products ranging from granzyme B to CD25 to CCR5 (4). In contrast to ICAM-1, elevated expression of LFA-1 is independent of IL-12. Thus, clustering is particularly dependent on factors, such as IL-12, that are able to sustain expression of ICAM-1. IL-12 might also regulate the functional activity of LFA-1 during T cell activation. Our results suggest that IL-12 may be vital to our understanding of the dynamic behavior of T cell clusters that have been observed in vivo in response to Ag and adjuvant (22) and to the clustering of T cells around APCs during the T cell swarming phase (21). Because the ICAM-1 ligand, LFA-1, is only expressed on hematopoietic cells, the regulation of T cell ICAM-1 expression by inflammatory cues may serve as a mechanism for assessing the activation state of the local environment and maintaining interactions with LFA-1+ cells in an activated lymph node. Although LFA-1 is also expressed on DCs, our results show that ICAM-1 expression on T cells is dispensable for efficient interaction of T cells with Ag-laden DCs. These results are consistent with previous studies suggesting that the LFA-1 expressed on DCs is functionally inactive (40–42) and with other recent studies of ICAM-1–deficient T cells (25). While this paper was under review, two groups reported that T cell ICAM-1 and T cell:T cell contacts positively regulate CD8 recall responses (25, 67). Cox et al. (67) reported an elevated number of KLRG-1hiIFN-γ+ effector-like T cells in ICAM-1–deficient hosts following LCMV challenge. Although this study focused on the effector and memory phases of the response, their findings are consistent with our results showing enhanced IFN-γ and KLRG-1 expression by ICAM-1–deficient OT-I T cells at early time points after activation both in vitro and in vivo. Previous work has shown that upon transfer into naive hosts, OT-I T cells initially activated in vitro with Ag, B7-1, and IL-12 undergo Ag-independent expansion and contraction that ultimately results in a stable population of memory T cells (2). A decrease in proliferative potential has been proposed to be a function of an intermediate-to-terminally differentiated T cell state (60). Thus, our finding that ICAM-1–deficient OT-I T cells exhibit impaired Ag-independent expansion after transfer is consistent with the hypothesis that loss of clustering is associated with increased differentiation toward a short-lived effector phenotype. The work by Cox et al. (67) also provides evidence that the ICAM-1 dependent maintenance of KLRG-1hi CD8 T cells after primary Ag challenge during the memory phase is not dependent on lymphocyte ICAM-1 expression. Thus, ICAM-1 expression on different cell populations in vivo is likely to play distinct functions in controlling the quality and quantity of the CD8 T cell response. Gérard et al. (25) describe a key differentiation period after the initial 16–24 h of Ag exposure where ICAM-1–mediated interactions between activated T cells enhance CD8 T cell differentiation (25). In contrast to our results, this work demonstrated reduced numbers of activated T cells and percentage of T cells expressing IFN-γ following ablation of ICAM-1–mediated interactions at this critical differentiation time window. It is interesting to note that in contrast to Gérard et al. (25) we ablated ICAM-1–mediated interactions in our in vitro system throughout the entire period of Ag exposure. Thus, there may be critical temporal differences in the role of ICAM-1 in controlling CD8 T cell differentiation. Our results provide additional support for a complex role for T cell homotypic clustering in regulating CD8 T cell differentiation. Some of the differences between our results and those of Cox et al. (67) and Gérard et al. (25) may also be due to the use of different strains of ICAM-1–deficient mice. We used the ICAM-1tm1jcgr line, which lacks expression of full-length ICAM-1 but has been shown to express a subset of alternatively spliced ICAM-1 isoforms (30). In contrast, Cox et al. used the ICAM-1tm1Alb line, which deletes the entire coding sequence and is thus completely deficient in ICAM-1 expression (68). A third ICAM-1 line, ICAM-1tm1Bay, has also been produced that expresses alternatively spliced ICAM-1 isoforms (69). An ICAM-1 isoform expressed by ICAM-1tm1Bay mutant mice, but not by ICAM-1tm1jcgr mutant mice, contains the Mac-1 binding domain. The specific strain of ICAM-1–deficient mice, either ICAM-1tm1jcgr or ICAM-1tm1Bay (both available from The Jackson Laboratory), used by Gérard et al. (25) is not clear. The functional significance of these ICAM-1 isoforms is indicated by the observation that the development and progression of experimental autoimmune encephalomyelitis is exacerbated in ICAM-1tm1Bay mutant mice, whereas it is attenuated in ICAM-1tm1jcgr and ICAM-1tm1Alb mutant mice (66, 70). This highlights the need to further investigate the functional contribution of both full-length ICAM-1 and ICAM-1 isoforms to T cell activation and differentiation. We thank Dr. B. Burbach, Dr. K. Hogquist, and J. Fiege for helpful discussion; Drs. K. Hogquist and G. Stritesky for the GFP-Nur77 OT-I mice; D. Lins and Dr. J. Curtsinger for technical assistance; M. Conley (Essen Bioscience, Ann Arbor, MI) for assistance with cluster analysis; and T. Lee, S. Brandt, F. Shoyama, and S. Jin for mouse genotyping and colony maintenance. This work is supported by National Institutes of Health Grants R01 AI038474 (to Y.S.) and T32 CA009138 (to N.A.Z.) and by pilot funding from a Cancer Center support grant at the Masonic Cancer Center, University of Minnesota (to Y.S.).
. 2010. Inflammatory cytokines as a third signal for T cell activation. Curr. Opin. Immunol. 22: 333–340.
. 2009. Programming for CD8 T cell memory development requires IL-12 or type I IFN. J. Immunol. 182: 2786–2794.
. 2006. Signals required for programming effector and memory development by CD8+ T cells. Immunol. Rev. 211: 81–92.
. 2009. Gene regulation and chromatin remodeling by IL-12 and type I IFN in programming for CD8 T cell effector function and memory. J. Immunol. 183: 1695–1704.
. 2005. Type I IFNs provide a third signal to CD8 T cells to stimulate clonal expansion and differentiation. J. Immunol. 174: 4465–4469.
. 2005. Type I interferons act directly on CD8 T cells to allow clonal expansion and memory formation in response to viral infection. J. Exp. Med. 202: 637–650.
. 2007. IL-21 promotes differentiation of naive CD8 T cells to a unique effector phenotype. J. Immunol. 178: 7640–7648.
. 2009. A vital role for interleukin-21 in the control of a chronic viral infection. Science 324: 1572–1576.
. 2011. CD8+ T cells: foot soldiers of the immune system. Immunity 35: 161–168.
. 2006. Programming, demarcating, and manipulating CD8+ T-cell memory. Immunol. Rev. 211: 67–80.
. 2007. Heterogeneity and cell-fate decisions in effector and memory CD8+ T cell differentiation during viral infection. Immunity 27: 393–405.
. 1999. The immunological synapse: a molecular machine controlling T cell activation. Science 285: 221–227.
. 2007. T-cell receptor signaling to integrins. Immunol. Rev. 218: 65–81.
. 2003. T-cell integrins: more than just sticking points. J. Cell Sci. 116: 4695–4705.
. 2003. Homing and cellular traffic in lymph nodes. Nat. Rev. Immunol. 3: 867–878.
. 2008. Intercellular adhesion molecule-1‑dependent stable interactions between T cells and dendritic cells determine CD8+ T cell memory. Immunity 28: 258–270.
. 2005. Lack of ICAM-1 on APCs during T cell priming leads to poor generation of central memory cells. J. Immunol. 175: 2201–2211.
. 1992. LFA-1‑dependent OKT3-driven T cell clusters in common variable immunodeficiency. Clin. Exp. Immunol. 87: 46–52.
. 1986. A human intercellular adhesion molecule (ICAM-1) distinct from LFA-1. J. Immunol. 137: 1270–1274.
. 2010. Immunological synapses within context: patterns of cell-cell communication and their application in T-T interactions. Curr. Top. Microbiol. Immunol. 340: 25–50.
. 2008. A synaptic basis for paracrine interleukin-2 signaling during homotypic T cell interaction. Immunity 29: 238–248.
. 1997. In vivo detection of dendritic cell antigen presentation to CD4+ T cells. J. Exp. Med. 185: 2133–2141.
. 2003. Dynamic changes during the immune response in T cell-antigen-presenting cell clusters isolated from lymph nodes. J. Exp. Med. 197: 269–280.
. 2013. Secondary T cell-T cell synaptic interactions drive the differentiation of protective CD8+ T cells. Nat. Immunol. 14: 356–363.
. 2003. The outcome of T-cell costimulation through intercellular adhesion molecule-1 differs from costimulation through leucocyte function-associated antigen-1. Immunology 108: 152–157.
. 2006. Costimulation of naive human CD4 T cells through intercellular adhesion molecule-1 promotes differentiation to a memory phenotype that is not strictly the result of multiple rounds of cell division. Immunology 118: 549–558.
. 2002. Stimulation through intercellular adhesion molecule-1 provides a second signal for T cell activation. J. Immunol. 168: 5530–5537.
. 2011. Choice of resident costimulatory molecule can influence cell fate in human naive CD4+ T cell differentiation. Cell. Immunol. 271: 418–427.
. 1994. Leukocytosis and resistance to septic shock in intercellular adhesion molecule 1-deficient mice. J. Exp. Med. 180: 95–109.
. 2011. T cell receptor signal strength in Treg and iNKT cell development demonstrated by a novel fluorescent reporter mouse. J. Exp. Med. 208: 1279–1289.
. 2012. Autocrine IFN-γ promotes naive CD8 T cell differentiation and synergizes with IFN-α to stimulate strong function. J. Immunol. 189: 659–668.
. 2003. Signal 3 determines tolerance versus full activation of naive CD8 T cells: dissociating proliferation and development of effector function. J. Exp. Med. 197: 1141–1151.
. 2007. Adhesion and degranulation-promoting adapter protein (ADAP) positively regulates T cell sensitivity to antigen and T cell survival. J. Immunol. 179: 3559–3569.
. 2003. CD8 T cell clonal expansion and development of effector function require prolonged exposure to antigen, costimulation, and signal 3 cytokine. J. Immunol. 171: 5165–5171.
. 2008. IL-10 and PD-L1 operate through distinct pathways to suppress T-cell activity during persistent viral infection. Proc. Natl. Acad. Sci. USA 105: 20428–20433.
. 2004. PD-L1‑deficient mice show that PD-L1 on T cells, antigen-presenting cells, and host tissues negatively regulates T cells. Proc. Natl. Acad. Sci. USA 101: 10691–10696.
. 2004. Integrins and T cell-mediated immunity. Annu. Rev. Immunol. 22: 157–180.
. 2005. Molecular mechanisms that set the stage for DC-T cell engagement. Immunol. Lett. 97: 199–208.
. 2006. Organization of the integrin LFA-1 in nanoclusters regulates its activity. Mol. Biol. Cell 17: 4270–4281.
. 2011. The lymphoid chemokine CCL21 triggers LFA-1 adhesive properties on human dendritic cells. Immunol. Cell Biol. 89: 458–465.
. 1996. Inhibition and stimulation of LFA-1 and Mac-1 functions by antibodies against murine CD18: evidence that the LFA-1 binding sites for ICAM-1, -2, and -3 are distinct. J. Leukoc. Biol. 60: 758–765.
. 2010. Visualizing the functional diversification of CD8+ T cell responses in lymph nodes. Immunity 33: 412–423.
. 2011. Highly activated cytotoxic CD8 T cells express protective IL-10 at the peak of coronavirus-induced encephalitis. J. Immunol. 186: 3642–3652.
. 2010. Early signals during CD8 T cell priming regulate the generation of central memory cells. J. Immunol. 185: 263–272.
. 2009. CD28 and CTLA-4 coreceptor expression and signal transduction. Immunol. Rev. 229: 12–26.
. 2011. The emerging role of CTLA4 as a cell-extrinsic regulator of T cell responses. Nat. Rev. Immunol. 11: 852–863.
. 1995. CD28 and CTLA-4 have opposing effects on the response of T cells to stimulation. J. Exp. Med. 182: 459–465.
. 2012. Activation of the Hippo pathway by CTLA-4 regulates the expression of Blimp-1 in the CD8+ T cell. Proc. Natl. Acad. Sci. USA 109: E2223–E2229.
. 2007. High IFN-γ production of individual CD8 T lymphocytes is controlled by CD152 (CTLA-4). J. Immunol. 178: 2132–2140.
. 2009. CD152 (CTLA-4) regulates effector functions of CD8+ T lymphocytes by repressing eomesodermin. Eur. J. Immunol. 39: 883–893. 2009. CTLA-4 co-receptor impacts on the function of Treg and CD8+ T-cell subsets. Eur. J. Immunol. 39: 687–690.
. 2005. Effector and memory CD8+ T cell fate coupled by T-bet and eomesodermin. Nat. Immunol. 6: 1236–1244.
. 2013. Differential localization of T-bet and Eomes in CD8 T cell memory populations. J. Immunol. 190: 3207–3215.
. 2009. Impact of epitope escape on PD-1 expression and CD8 T-cell exhaustion during chronic infection. J. Virol. 83: 4386–4394.
. 2012. Transcriptional control of effector and memory CD8+ T cell differentiation. Nat. Rev. Immunol. 12: 749–761.
. 1986. The requirement for lymphocyte function-associated antigen 1 in homotypic leukocyte adhesion stimulated by phorbol ester. J. Exp. Med. 163: 1132–1149.
. 2005. ICAM-1 co-stimulates target cells to facilitate antigen presentation. Curr. Opin. Immunol. 17: 251–258.
. 2000. Src homology domain 2-containing tyrosine phosphatase 2 associates with intercellular adhesion molecule 1 to regulate cell survival. J. Biol. Chem. 275: 30029–30036.
. 2000. Circulating forms of intercellular adhesion molecule (ICAM)-1 in mice lacking membranous ICAM-1. Blood 95: 1350–1355.
. 2003. ICAM-1 isoforms: specific activity and sensitivity to cleavage by leukocyte elastase and cathepsin G. Eur. J. Immunol. 33: 1351–1360.
. 2010. Differential ICAM-1 isoform expression regulates the development and progression of experimental autoimmune encephalomyelitis. Mol. Immunol. 47: 1692–1700.
. 2013. ICAM-1‑dependent tuning of memory CD8 T-cell responses following acute infection. Proc. Natl. Acad. Sci. USA 110: 1416–1421.
. 2003. Mac-1, but not LFA-1, uses intercellular adhesion molecule-1 to mediate slow leukocyte rolling in TNF-α‑induced inflammation. J. Immunol. 171: 6105–6111.
. 1993. Inflammatory and immune responses are impaired in mice deficient in intercellular adhesion molecule 1. Proc. Natl. Acad. Sci. USA 90: 8529–8533.
. 2007. Intercellular adhesion molecule-1 expression is required on multiple cell types for the development of experimental autoimmune encephalomyelitis. J. Immunol. 178: 851–857.